It is no secret that the recovery from the 2008 financial crisis has been a long and grueling one. But with interest rates set to rise in 2018, national unemployment at its lowest point in 16 years, and financial markets performing exceptionally well, it appears that the recovery process is finally over and the economy is growing once again. Indeed, 2017 so far has been an outstanding year for financial markets. 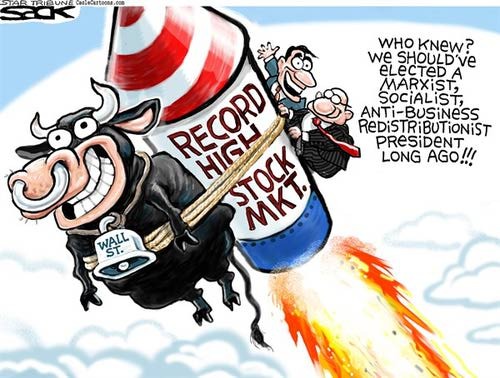 News that the stock market is currently reaching all time highs has been celebrated, tweeted, and even proudly proclaimed by some of America’s politicians. While there is much to celebrate, it is important not to become too carried away. Economic growth is a complicated phenomena that is measured in a variety of different ways. Stocks are essentially partial ownership of a firm and when stock performance increases, it is an indicator of increased faith in the profitability of firms. However, while stocks are important an economic signal, they are only a small part of the entire picture of economic health. Gross Domestic Product (GDP), though not perfect, is meant to provide a more realistic indication of economic growth. Unlike stocks, which report earnings of public companies, GDP is comprised of more inclusive data of all markets in an economy, including investment, government spending, consumption, and the foreign balance of trade. GDP (especially real GDP which adjusts for inflation rates) is used as a broad measurement of economic activity and an estimate of the standard of living. There are many ways in which GDP and stock market returns do affect one another, and it is intuitive to assume that strong economic growth and high stock market returns are correlated. However, data from the long run shows us that the relationship between real GDP growth and stock returns are weak, or even in some cases non existent. In fact, in most countries around the world, including the United States, stock returns on average have greatly outweighed real GDP growth since the 1970’s. This lack of correlation between real GDP and stock market returns can be explained by the fact that although they are related in some ways, they fundamentally represent different things. Long-term economic growth and especially real wage growth are in many ways independent of fluctuating financial markets. This is why it is important, especially for politicians who should be concerned with long-term growth, to not become overly excited by the all time highs Wall Street has been reporting. Real GDP, sustainable employment opportunities, and real wage growth against inflation are what is important to most Americans. In fact, many Americans may not even be feeling the benefits from the current bull market. According to Gallup, in 2016 only about 52% of Americans currently have money invested in the market (either through stocks, mutual funds, or retirement plans like a 401(k)), with the wealthiest 10% owning 81% of all stocks. This means that almost half of Americans are missing out on the enormous heights stock returns are reaching almost daily. Though it is true that some wealth may trickle down to those who are sitting out on the gains to be made, it is also suggests that there is still a lot that needs to be done in order to raise the standard of living for millions living in the United States. Simply rejoicing over financial market returns is not enough. Financial markets may also not be displaying the entire economic reality because of the extensive rounds of quantitative easing (QE) that took place in response to the financial crisis of 2008. After the crisis, the Federal Reserve essentially created money to buy the enormous debts banks held on their balance sheets in order to preserve the supply of credit to the rest of the economy. A healthy supply of credit is vital in order to keep the economy going (think about what would happen if no one could get a loan to start a business or buy a house), but there are repercussions of QE. One such example is the prevalence of low interest rates coupled with over valued assets. According to The Economist, the enormous returns in financial markets today is likely the result of rounds of QE from 10 years ago. American consumers and demand are by far the biggest factors driving economic growth. Another consequence of QE is the result of creating or sustaining a false level of demand in the economy. Think about walking into a store and seeing something so ridiculously cheap, so heavily marked down from its original price that you buy it even if you do not really need it or even want it. That’s essentially what has been going on in the economy as a result of QE. And with interest rates are set to rise this year, it is imperative that demand levels do not fall. Keeping domestic demand strong and therefore the purchasing power of the American consumer strong is a determining factor of the health of the American economy. This is done by ensuring real economic growth, wage growth, and productivity growth. Despite a slow but sure recovery from the Great Recession, productivity growth has been sluggish within the Western world in recent years. This may be due to the low interest rates allowing companies that would otherwise go under to survive, new innovations being less significant than older innovations, and a preference among businesses to use extra labor when wages are low. Either way, low productivity growth is detrimental to the economy in the long-run. In order to ensure real economic growth, rising wages, and a higher standard of living for a majority of Americans, policy makers must be keen on creating sustainable opportunities, incentives to spur innovation, and adjust our economic model to be competitive on a global scale. Not so much concern themselves with the fluctuations in financial markets. We cannot afford to sit back and relax even though stock market returns might indicate otherwise. The economic outlook still has not improved for millions of Americans and there are still challenges we face to ensure equal opportunities and an increasing standard of living for all. With rising interest rates just around the corner, it is important to ensure the American economy is healthy enough to not only remain resilient in the face of a stock market correction, but to continue to grow at healthy rates in order to ensure a better life for its citizens. Previous Entry Is the Price Right?